A diamond sapphire engagement ring should be at the top of your list if you’re thinking of moving your relationship up to the next level. While men out shopping for an engagment ring on their own will choose the simplicity of a diamond solitaire, most women prefer at least one colored gemstone and overwhemingly pick sapphires, emeralds or rubies. In recent years, diamonds have seen a decline while colored gemstone sales, especially for sapphires, are up. This means that a diamond sapphire engagement ring is a pretty safe bet if you’re out looking on your own. 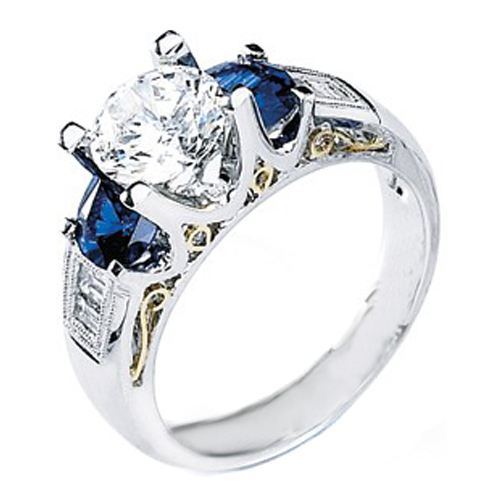 Sapphire prices are driven by popularity and have risen 37% since 2006. Despite this rise, most colored gemstones are still cheaper than diamonds, though they lack a grading scale making harder to determine the quality of the stones being purchased. Diamond sapphire engagement rings have seen a surge since the engagement of Prince William and Kate Middleton. He chose to give her the same ring chosen by his mother, Princess Diana, a 12-carat Ceylon sapphire surrounded by 14 diamonds and set in 18-carat white gold. Modern royal families are not alone in their love of sapphires! This colored gemstone was incredibly popular amongst medieval royalty and in 1796 Emperor Napoleon Bonaparte presented his wife Josephine with a diamond and sapphire engagement ring. Each stone was 1-carat and they were set next to one another in yellow gold. Sapphires paired with diamonds are an excellent choice for engagment rings, as sapphires stand for truth, fidelity and faithfulness, while diamonds symbolize love and beauty. What wonderful feelings to invoke as you take the steps forward into the greatest commitment of your life!